Eugene, Ore. - On Friday, November 2, the Capitol Christmas Tree was cut and prepared for the more than 3,000-mile journey. The 175th anniversary of the Oregon Trail inspired the theme and the tree will follow a reverse path of the trail on its way to Washington, D.C.
A series of festive events will be hosted by local communities, including three in Lane County, at museums, main streets, city halls, state capitols, markets, retailers and high schools. 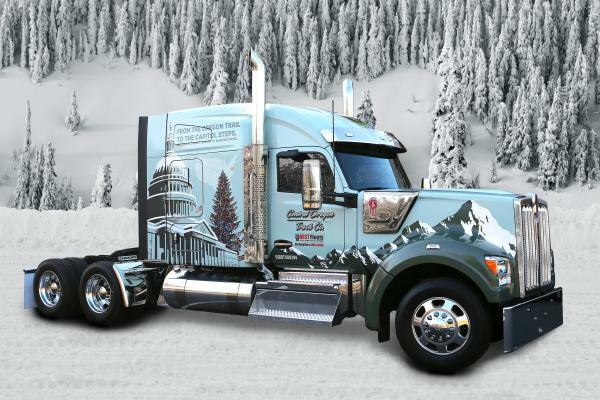 Attendees will have the chance to sign banners on the sides of the truck to wish the tree well, learn more about the Willamette National Forest and the great state of Oregon, purchase U.S. Capitol Christmas Tree merchandise and more.